We've seen just one photo from the forthcoming drama The Judge starring Robert Downey Jr. and Robert Duvall, but with the film arriving in October of this year, there's likely a trailer coming right around the corner. 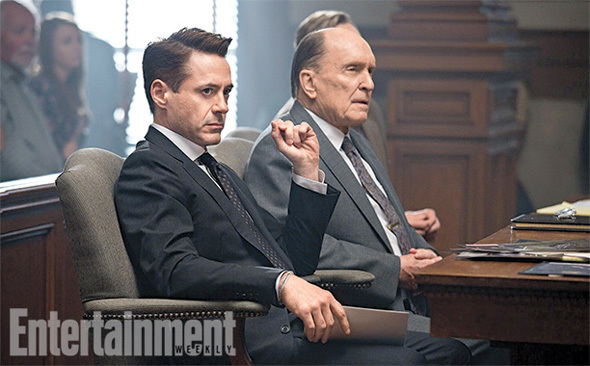 In the meantime, one more photo has shown up that fits more in line with the title of the film as it finds Downey and Duvall sitting in court. Downey plays an attorney returning to his hometown for his mother's funeral. Although Duvall's character is the town judge, he's also the only suspect in a murder and Downey must balance the many years of estrangement and emotional distance in order to find the truth. Glad to see Downey Jr in a serious role. Yes. Lately we've gotten a little too much dessert with him and not enough meat. Don't get me wrong; I love the snark, but occasionally I want something more. Agreed. His snark is legandary but his dramatic flair is all the better. This movie was filmed in my hometown. So much fun to watch and RDJ was amazing with us locals. Class act.